Built in seat with fridge/freezer in cockpit (with cover) made by Riviera. This boat has the Volvo Active corrosion protection system. o	In Nov/Dec 2018 hull and topsides were polished. o	In Nov/Dec 2018 the Vovlo engines, IPS pods and cooling systems were all serviced. 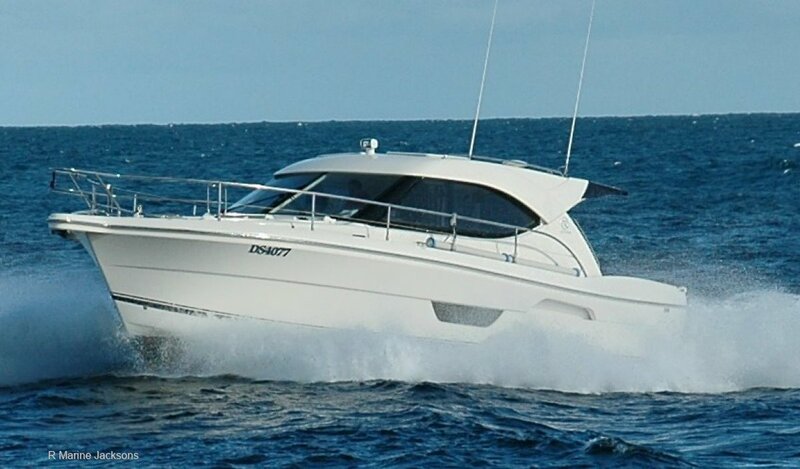 This boat has been fastidiously maintained by the owner and is welcome to any inspection. It is also probably the most highly optioned Riviera 3600 Sports Yacht EVER produced with some of the options. So please call R Marine Jacksons to take advantage of the savings over a new boat. Master bedroom up forward with a guest cabin with a double and single bed included. Opposite is a head with toilet and shower. In the saloon is a lounge, helm and galley to starboard forward of a stainless doorway and stainless hopper window that opens to the relaxing cockpit.